PNG kids inspire comeback by Blighty? 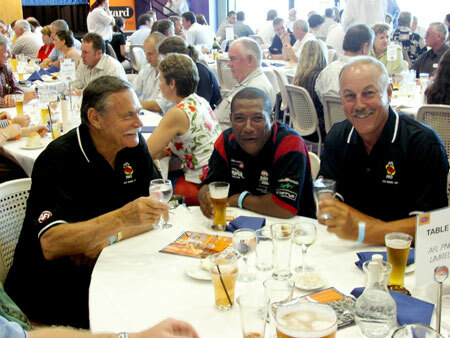 Football playing and coaching legend Malcolm Blight has spent the past few years relaxing in Queensland, away from the pressures of the AFL. But an impromptu training session with some talented young Papua New Guinean players may have rekindled his passion for coaching. The following story courtesy of AFL-PNG and Neil Kearney, from the 9th March 2005 The Advertiser, Adelaide, South Australia. MALCOLM Blight is making a surprise return to football - as a commentator - but don't be surprised if he coaches again. The dual-premiership coach, who was dramatically sacked by St Kilda four years ago, is ending his self-imposed exile from AFL by taking a commentary role for Network Ten this season. Speaking yesterday at his home in far-north Queensland, where he is bracing himself for tropical cyclone Ingrid to hit the coast today, Blight said his time away from football had rekindled his enthusiasm. "I'm dipping my toe in the water this year and we'll see what happens after that," he said, before taking a dip in his backyard pool. "I'm more than happy here but I'm not saying never again. I said never twice before. Blight, 55, has rejected coaching offers from at least two clubs in the past year and had seemingly walked away from the game that had given him Hall of Fame status and often considerable anguish. "I said, 'I think I've got a taste for footy again'. "As luck or fate would have it, David Barham (Channel 10 executive producer of AFL) rang me next morning and asked if I'd like to do some commentary." Blight has signed on to be expert commentator for nine matches this season - four home and away games in Brisbane, two at Sydney's Telstra Stadium and three finals. He will begin with the Brisbane-Sydney clash in round three. Ten sees Blight as a strong presence in the northern markets as it telecasts AFL into Brisbane every Saturday night this season. The Wizard Cup match three weeks ago that sparked his interest in commentary also renewed his enthusiasm for coaching. After the game he found himself conducting an impromptu clinic with four boys from Papua New Guinea, who had played in a curtain-raiser to the Brisbane-Melbourne match. "Holding the ball and showing them kicking skills, I found I had missed the teaching aspect," he said. Yesterday, when asked if he felt the urge to coach football again, he said: "At that point, I certainly did. "Do I need it (football)? Yeah, I do. Emotionally, yeah. "What I'm doing this year is probably more than a toe back in the water - let's see what unfolds." Two years in the tropics have both invigorated Blight and cleared his head after the trauma of his St Kilda sacking. He has become a Howard Hughes-like character, shirking approaches from hopeful clubs and media, but yesterday he was relaxed and looking as fit as in his playing days. He plays golf at least three or four times a week and lives within a nine-iron shot of the sixth green at the Palm Cove Country Club, where he plays off a 10 handicap.